When first introduced, brushless DC motors, despite their many advantages, were cast as a costly alternative to brush-commutated motors and were typically only specified for low-power applications where long life was the primary desired requirement. Without the mechanical brush-commutator mechanism that would wear and eventually result in motor failure, brushless motors could be relied upon to deliver performance over time. As for other advantages, conventional wisdom held that brushless motors provide high speed and fast acceleration, generate less audible noise and electromagnetic interference, and require low maintenance. Brush-commutated motors, on the other hand, would afford smooth operation and greater economy. In the past decade, though, brushless motors have gained broader appeal and greater acceptance in industry for a wider range of applications previously dominated by brush-commutated products, due in part to dramatic reductions in the cost and size of electronic components and advances in motor design and manufacturing. At the same time, manufacturers have further sought to challenge conventional wisdom by improving brushless motor design in an effort to combine the traditional advantages of brush-commutated and brushless types. A noteworthy example of how far these innovations have progressed involves the slotless (instead of slotted) construction of the brushless motor’s stationary member, or stator. The slotless stator design originated with the goal to deliver smooth running performance and eliminate cogging, which is an unwanted characteristic especially in slower-running applications (less than 500 rpm). The absence of cogging is, in fact, the most-often cited reason for selecting a slotless brushless motor. Most brushless motors (slotted or slotless) use electronic commutation, usually Hall-effect sensors and magnets, in place of brushes. The motor’s rotor consists of a steel shaft with permanent magnets or a magnetic ring fixed around the circumference of the shaft. The magnets are responsible for producing torque. As the flux density of the magnet material increases, the amount of torque available from the rotor assembly increases. In traditional slotted brushless motors, the stator features a group of slotted steel laminations (0.004 in. to 0.025 in. thick), which are fused to form a solid uniform stack and create a series of teeth. Wound copper coils, which produce electromagnetic fields, are then inserted into each of the slots. Together, the laminated stack and wound copper coil form the stator assembly. The return path completing the magnetic circuit consists of the laminated material outboard of the copper windings in the stator and the motor housing. These brushless slotted motors are especially powerful, because the teeth around which the copper wire is wound place the iron closer to the magnets, so the magnetic circuit is completed more efficiently. As the air gap between iron and magnets is reduced, the torque available for the motor is increased. However, slotted stators are known to cause cogging, which is attributed to the teeth in their construction. Cogging occurs when the permanent magnets on the rotor seek a preferred alignment with the slots of the stator. Winding copper wires through the slots tends to increase this effect. As magnets pass by the teeth, they have a greater attraction to the iron at the ends of the teeth than to the air gaps between them. This uneven magnetic pull causes the cogging, which ultimately contributes to torque ripple, efficiency loss, motor vibration, and noise, as well as preventing smooth motor operation at slow speeds. A slotless stator offered a solution to the problems experienced with cogging in slotted brushless DC motors. 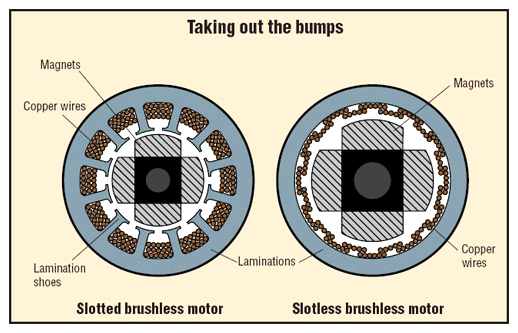 Instead of winding copper wires through slots in a laminated steel stack as in conventional slotted brushless motors, slotless motor wires are wound into a cylindrical shape and are encapsulated in a hightemperature epoxy resin to maintain their orientation with respect to the stator laminations and housing assembly. This configuration, which replaces the stator teeth, eliminates cogging altogether and results in desired quiet operation and smooth performance. The slotless design also reduces damping losses related to eddy currents. These currents are weaker in a slotless motor, because the distance between the laminated iron and magnets is greater than in a slotted motor. Slotless motors are typically designed with sinusoidal torque output that produces negligible distortion, rather then a trapezoidal voltage output. The sinusoidal output reduces torque ripple, especially when used with a sinusoidal driver. Because the slotless design has no stator teeth to interact with the permanent magnets, the motor does not generate detent torque. In addition, low magnetic saturation allows the motor to operate at several times its rated power for short intervals without perceptible torque roll-off at higher power levels. Compared with slotted motors, slotless construction also can significantly reduce inductance to improve current bandwidth. The teeth in a slotted motor naturally cause more inductance: the coils of copper wire around the teeth interact with the iron in a slotted motor, and this interaction tends to send the current back on itself, resulting in more damping (or dragging) and impacting negatively on slotted motor response and acceleration. In terms of delivering power, conventional slotted motors used to enjoy the advantage over slotless types, due (as noted) to the proximity of iron and magnets and the reduced air gap. However, this advantage has virtually evaporated, in large part due to the utilization of high-energy, rare-earch magnets (such as samarium cobalt and neodymium iron boron). By incorporating these magnets, manufacturers of slotless brushless motors have been able to routinely compensate for the greater air-gap distance. These more powerful magnets effectively enable the same (or better) torque performance for slotless products compared with slotted. Eliminating the teeth and using stronger magnets both serve to maximize the strength of the electromagnetic field for optimum power output. Rare-earth magnets, along with the fact that fewer coils, or “turns,” of the wire are required in slotless motors, also help contribute to low electrical resistance, low winding inductance, low static friction, and high thermal efficiency in slotless motor types. One more important difference between slotless and slotted designs is the rotor diameter. Slotless motors have a larger rotor diameter than slotted construction for the same outside motor diameter and will generate a higher inertia, as well as accommodating more magnet material for greater torque. For applications with high-inertia loads, the slotless product is more likely to be specified. In general, brushless motors are usually selected over brushcommutated motors for their extended motor life. (While motor life is application-specific, 10,000 hours are usually specified.) Other reasons for specifying brushless motors include a wide speed range, higher continuous torque capability, faster acceleration, and low maintenance. In particular, slotless versions of brushless DC motors will suit those applications that require precise positioning and smooth operation. Typical niches for these motors include computer peripherals, mass storage systems, test and measurement equipment, and medical and clean-room equipment. Slotless brushless DC motors, as with most motors today, feature a modular design so they can be customized to meet specific performance requirements. As examples, planetary or spur gearheads can be integrated on motors for an application’s specific torque and cost requirements. Planetary gearheads offer a higher-torque alternative. Slotless motors can further be customized with optical encoders, which provide accurate position, velocity, and direction feedback that greatly enhances motor control and allows the motors to be utilized in a wider range of applications. As a low-cost alternative to optical encoders, rotor position indicators (ie. Hall Sensors) can be specified. When using optical encoders, differential line drivers can be utilized to eliminate the effects of electrically noisy environments. Differential line drivers are designed to ensure uncorrupted position feedback from the encoder to the control circuit. Despite the overall design and performance comparisons reviewed here for slotless and slotted brushless DC motor types, one should remain cautious in drawing any conclusion that one type is the ultimate choice over the other. There are simply too many variables that must be evaluated, ranging from rotor size and windings to housing and special components. A given application and its requirements should (and will) be the guiding factors in selecting a particular motor type and the customized components to be incorporated. Some encouraging news in those applications that would clearly benefit from a slotless brushless motor is that costs are coming down to be more in line with those for slotted motors. This is because of new streamlined manufacturing techniques and an increasingly available supply of powerful magnets, which are both beginning to have a positive impact on end-product costs. « Motion Control Stages – Precision Crossed Roller, Brushless Linear Motor Stages!